Our good buddies over at Droid Forums just scooped up a nice flier from an insider showing a sweet deal that Costco will be hosting. 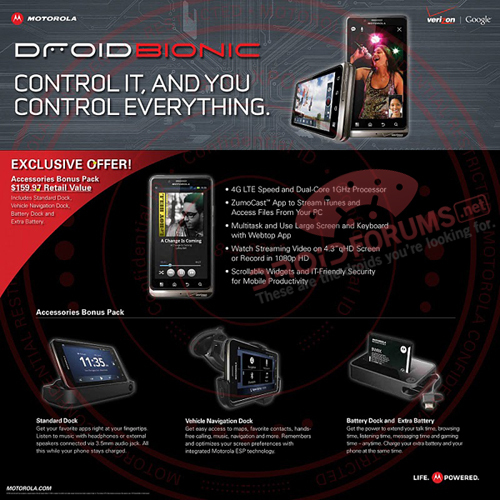 At time of release (September 8th), you can grab the DROID Bionic for its regular price of $299, and also get an “Accessories Bonus Pack”. It will include the standard dock which we have seen float around, a vehicle navigation dock, plus a must have for any 4G device, a battery dock and extra battery. Looks like there won’t be any reason to stand in line at Verizon, if Costco is having this deal. Everyone get your Costco cards ready.